At only $245, the CDL Sleep Study is thousands of dollars less than the fees typically charged by facility based Sleep Labs ($2000-$3000), and may be covered in part or fully by your insurer. The fee includes review and Interpretation by a Board Certified Sleep Physician, licensed in your home state, ensuring accurate assessment of your Sleep. Shipping is arranged according to your location, availability and urgency and can be arranged for next day delivery (shipping rates apply). The results are provided both to you and the Prescribing Physician and are yours to take for your healthcare records to any physician. 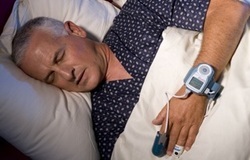 The CDL Sleep Study Service is a program of 1st Line Medical, Inc., an Independent Diagnostic Testing Facility providing Sleep Study services throughout the continental US for Sleep-focused physicians and their patients. Our patient focused service enables patients screened for potential Obstructive Sleep Apnea to obtain a convenient, cost effective Sleep Study on a timely basis at a fraction of the cost of participating in a formal Polysomnography (Sleep Study in a Lab). The Service is available by prescription only, but can be readily coordinated by any physician licensed to prescribe, by simply authorizing a Prescription Order form on your behalf. The Portable Device enables patients to participate in the Study Service when and where convenient for them, eliminating the need to schedule and accommodate a fixed lab facility's availability. Our standard service includes all aspects of the Medical Service including individual State-Licensed Sleep Specialist Physician Review and Report for delivery to you and your Prescribing Physician.